Click Here for venue directions. The below divisions will be accepting entries. Some divisions may be combined and some may be split due to the number of entries. If your team's division does not fill, you will be contacted to play up or receive a refund. Many divisions fill quickly and the tournament normally fills completely by late November, so register early. Entry Fee includes guarantee of 4 games, great competition, top referees, Gold, Silver & Bronze medal presentation, and opportunity for your team to participate in a Torch Lighting Ceremony. Fees are non-refundable after December 1, unless a division does not fill. California Winter Games will host a Torch Lighting Ceremony on Saturday, February 16th at San Diego Ice Arena. Family and friends will gather around the ice for the Torch Lighting Ceremony where teams will be introduced on the ice. Team captains will pass the torch before the cauldron is lit. Athletes should wear tennis shoes and their team jersey. Teams will be escorted by 2 coaches. Woodstock's Pizza will be onsite selling large slices. Stone Brewing Beer will be sold onsite for patrons over the age of 21 with valid id. We also encourage you to eat at Buca di Beppo or Epic Wings before or after the events. Click here for preferred restaurants. Time:There will be 2 sessions of Skills competition. Divisions will be assigned one of the two times. Session 1 Check in at 5pm. Session 2 Check-In at 6:20pm. 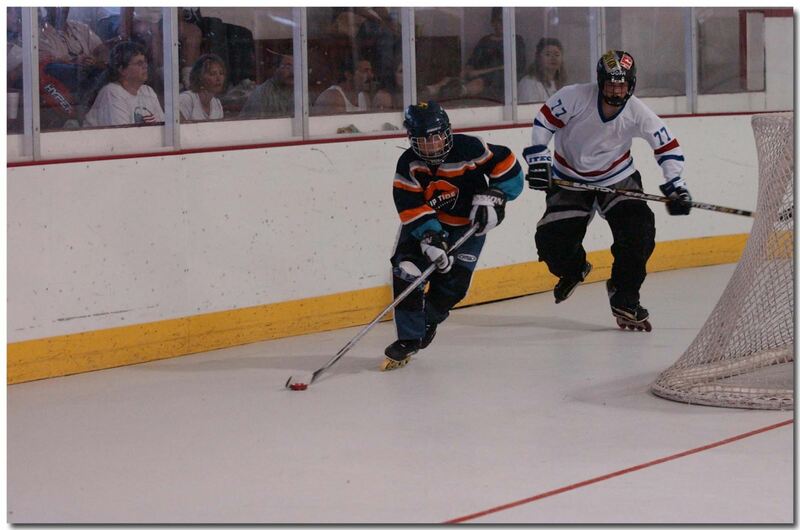 4 players from each team will participate in 1 of 3 events - Target Shooting, Speed & Breakaway. Teams must submit their player's names by January 31. Target Shooting: Targets will be attached to the net and each player will have 10 pucks to shoot as many targets as possible in 2 minutes. Speed: Each skaters will skate one lap as fast as possible. Holding their stick is permitted. Break Away: A goalie and a shooter participate. We keep stats on goalie saves and goals made by the shooter. Prizes for winning team in each division and winner of each event. To participate in the 2019 California Winter Games, all teams are required to book hotel accommodations at one of the listed CSG host hotels offered at discounted prices. See Hotel Discount page for details on rates and how to book your rooms. Teams choosing not to book hotel rooms at our host hotels are required to pay a $100 Deviation Fee per team made payable to California State Games. Upon completion of paid Deviation Fee, teams are accepted into the tournament. Deviation fees may be mailed in or paid online through our registration system. Exemptions: Teams residing in San Diego, Orange or Riverside County are exempt from the mandatory Hotel Booking Policy. First games will be held in the morning on Friday starting at 8am. Schedules will not be revised for a team's specific travel plans. Teams may submit a schedule request before December 14 via email to info@calstategames.org. Cal State Games reserves the right to close a division before the registration deadline. Many divisions fill up fast. Championship games will be played on Monday. Final game on Monday is estimated to be finished by 4pm. Home teams wear LIGHT jerseys and Away teams wear DARK jerseys. All teams must show proof of USA Hockey team registration, team roster and release forms for each player prior to their first game. Coaches must sign the scoresheet before each game. Most teams will play 15 minute stop time periods. 5 minute warm up time. No over time shall be permitted. Complete rules are posted above. Rosters should be submitted with the entry form. Birthdate of each player needs to accompany the roster.